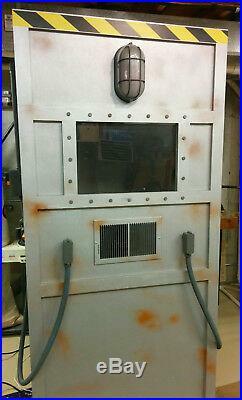 For your consideration: Custom Made Zombie Containment / Breakout Prop 6’8″ tall x 32″ wide x 25 deep. Includes all plastic conduit as shown, light fixture on front, 2ea 12v door poppers and mechanism on each side, and 12v amber lights on side boxes. No other electronics included. The back opens to access the inside of the prop. The prop is large enough inside for a person to stand. The prop is constructed with 2×2 dimensional lumber and luan plywood. The prop was built to be disassembled into 4 panels by removing 8 pocket screws that join the panels together. I have received a few inquires about this item, so I guess it needs a little more explanation. 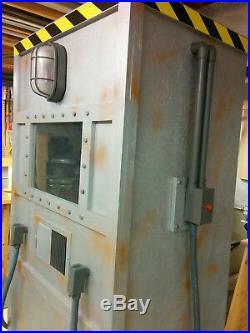 The prop is designed to be used with a DVD and monitor (to display a Zombie in the window) along with a decoder to activate the light at the top and also activate the poppers to make the sides move when the zombie bangs on either side of the box. The door poppers are 12v solenoids used on a car to open a door without using the door handle. I made a linkage to make the pull motion of the solenoid push the electrical box on either side of the box outward giving the illusion that the box was flexing. All of this is included with the box (poppers and all linkages) and is ready for use. In other implementations of this prop, pneumatics are used for this effect, but I already had the poppers so it was what I used. At the end of the video, the zombie escapes from the box, and at that point, an actor in the box can jump out of the door on the back of the box. The DVD that was used is’Zombie Containment: ZIB Volume 3 – Breakout Edition’ (again not included) from Monster Guts, LLC. They also sell the other electronics necessary for the prop to work. 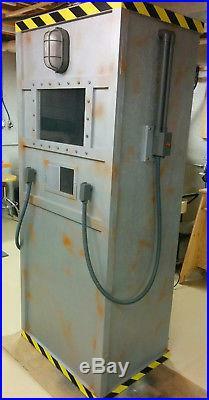 The item “Zombie Containment Unit / Breakout Halloween Prop Life-sized ZIB” is in sale since Tuesday, October 23, 2018. This item is in the category “Collectibles\Holiday & Seasonal\Halloween\Current (1991-Now)\Props”. The seller is “bluto-2012″ and is located in Belleville, Illinois. This item can’t be shipped, the buyer must pick up the item.